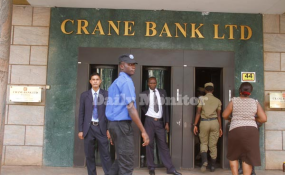 Police officers enter Crane Bank main branch in Kampala to beef-up security shortly after Governor Emmanuel Mutebile announced that BoU had taken over management of the bank. Mr Sudhir Ruparelia, the former owner of the closed Crane Bank, has said the bank's former shareholders want their Shs584b which he says Bank of Uganda (BoU) is holding illegally since the closure and takeover of the commercial bank. Mr Ruparelia said former shareholders had mobilised $23m (about Shs84b) to help their Crane Bank remain afloat but the money was injected into two installments before and after the bank's takeover. He said, however, the money did not save the bank from collapse because it was seized by Bank of Uganda despite the injection of additional capital. Separately, the former Crane Bank directors also want the bank's Bad Book worth Shs500b that was taken over by dfcu Bank upon liquidation to be returned to them. They say holding the Bad Book offends provisions of the Financial Institutions Act. A Bad Book is where a bank's loans are registered. "Prior to takeover, shareholders lent $8m (Shs29b) and after the takeover shareholders remitted $15.5m (Shs55b). The purpose of this money advanced was frustrated by BoU and therefore BoU has no basis to keep it. This money should be returned to shareholders," Mr Ruparelia told the ongoing parliamentary inquiry into closure of seven commercial banks. Mr Ruparelia also said "some of the money that BoU claims it injected into Crane Bank did not end up in Crane Bank." His claim tends to buttress queries by the Auditor General who is conducting a forensic audit into how the central bank used Shs478b it claims was injected into Crane Bank to prevent its collapse. When BoU officials led by Governor Tumusiime Mutebile and former director for commercial banks supervision Justine Bagyenda appear before the inquiry tomorrow, MPs will question them how they concluded the Crane Bank takeover that was worth Shs1.8 trillion in less than 24 hours. Former Crane Bank Board Chairman Joseph Biribonwa testified before the inquiry yesterday that BoU's closure and sale of Crane Bank to dfcu benefitted the latter as its customer base improved significantly in a short time with 600,000 active accounts and 47 new branches. "Even after claiming to sell Crane Bank assets for Shs200b, the Auditor General has since discovered that in fact the amounts had been discounted and as a result BoU recognised a present value of Shs160b. Therefore, on day one, dfcu was already making a profit of Shs39b to the prejudice of Crane Bank," Mr Biribonwa submitted. In July 2016, BoU ordered Crane Bank to stop the issuance of letters of credit, bid bonds, overdrafts, loans, bank guarantees and other financial services to its clients, effectively stopping the bank from conducting business, a development that shareholders say ultimately led to its poor performance. The former Crane Bank shareholders yesterday also raised the red flag over the money that was meant for capitalisation of the bank but was deposited on the central bank accounts and can't be accounted for. "At a time of its closure, Crane Bank shareholders had contributed as a loan $15m, but BoU demanded that the money be deposited into BoU and not Crane Bank. However, to date, no explanation of its whereabouts has been offered to the shareholders," Mr Biribonwa said.